India suffered a 9.1 per cent decrease in average Internet connection speeds in 2010 to 0.8 Mbps, compared to 2009. 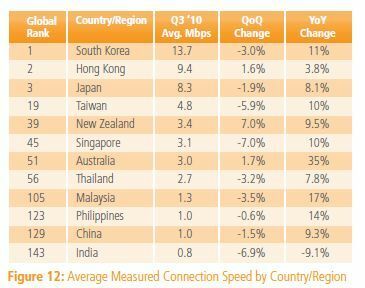 According to the State Of The Internet report by Akamai Technologies, Philippines and China have an average connection speed of 1 Mbps while Malaysia tops them at 1.3 Mbps. The average Singaporean enjoys 3.1 Mbps speeds. South Korea has the highest average connection speed of 13.7 Mbps, followed by Hong Kong with 9.4 Mbps and Japan with 8.3 Mbps. These are classified as "high broadband" as it crosses the 5 Mbps threshold. 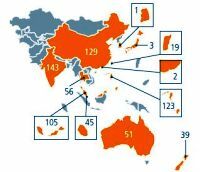 Year-over-year trends in the APAC region were positive, with the biggest increase seen in Australia, which ended 2010 with an average connection speed 35% higher than at the end of 2009. The adoption of "high broadband" (>5 Mbps) in India is at 0.4 per cent and has dropped 30 per cent in 2010. This is true of broadband adoption as well (>2 Mbps). The adoption of broadband in India as of 2010 was at 4.5 per cent. When it comes to average "narrow band" connectivity (>256 Kbps, or what the Indian telecom regulator TRAI terms as broadband) India has grown at a fast clip in 2010. As of end 2010, 35 per cent of all connections in India are at an average speed of 256 Kbps. The average peak connection speed increased to 5.1 MBps in India on an annual basis. The PDF is available for download here.